Good news for families! New fun-filled entertainment awaits you in the pedestrian village as of June 24. If you enjoyed the playful antics of the Grelots, the charming family of elves who became so popular during past holiday seasons, you will love the Bestibuzz! The authors of the Grelot family, Tohu-Bohu Productions, will make us smile again this summer with their original creation: a group of five larger-than-life creatures. The Bestibuzz, made up of Dazz, the honeybee, Moz, the fly, Pixelle, the ladybug, Zules, the dragonfly and Azelia, the butterfly, will spread good cheer in their wake by dancing and performing breathtaking acrobatics. Moreover, with their glowing wings, everyone will be able to admire their magical lights in the night parade. To better understand the origins of this fantastic band of joyful critters, we invite you to discover how they arrived at Tremblant by reading their story (here below). 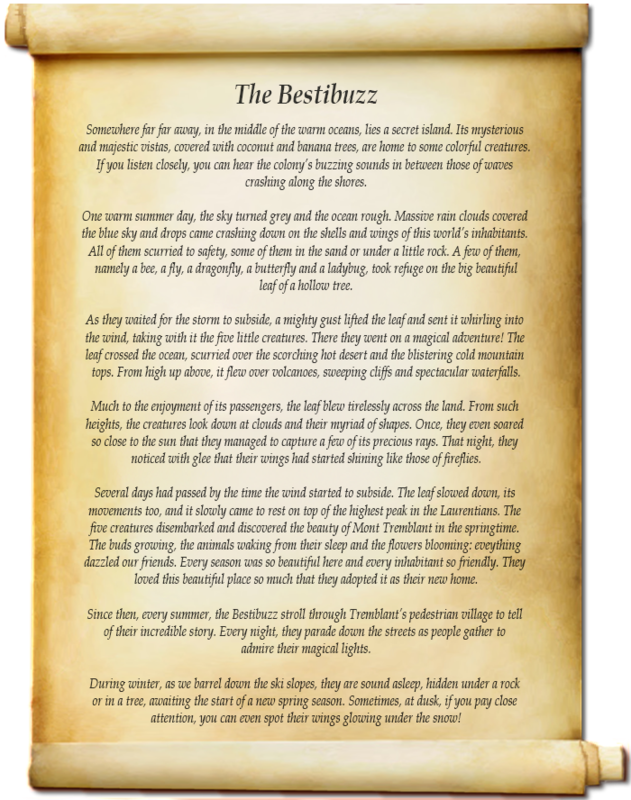 From secret islands to the highest clouds, the middle of the sea to the top of the mountain, embark on a great adventure in the imaginary world of the Bestibuzz!